A radio production examining contemporary concerns for lesbians, how lesbians view themselves, and the hostile and often impertinent world they face. Contains music, poetry, panel discussions, dramatizations and dramatic readings written, read and performed by lesbians. Conceived by the Women's Center for Theater and Media. Actors are Paul Hansen, Everett Frost, Sharon Adair, Juliana McCarthy and Judith Roberts. Discussion participants were from the Lesbian Feminists. Music performed by Sister Rosie and Lynn Patrick. Poetry by Harriette Frances from "Sappho '71", Elsa Gidlow, from "Moods of Eros" and Lee Munson from "Have You Been There?" Selections by Martha Shelley, Rita Mae Brown, Robby, Judy Grahn and the Gay Women's Lib were from "Lesbians Speak Out." Sharon Zecha's speech was given at the NOW General Meeting. Additional selections taken from the July 1971 issue of "Every Woman." Produced by Lee Sisson and Sherry Tyler. Written and compiled by Diane LaRue, Liz Stevens and Lee Sisson. Original music composed by Lynn Patrick. Directed by Constance Pfeifer. Technical coordination by Sherry Tyler. 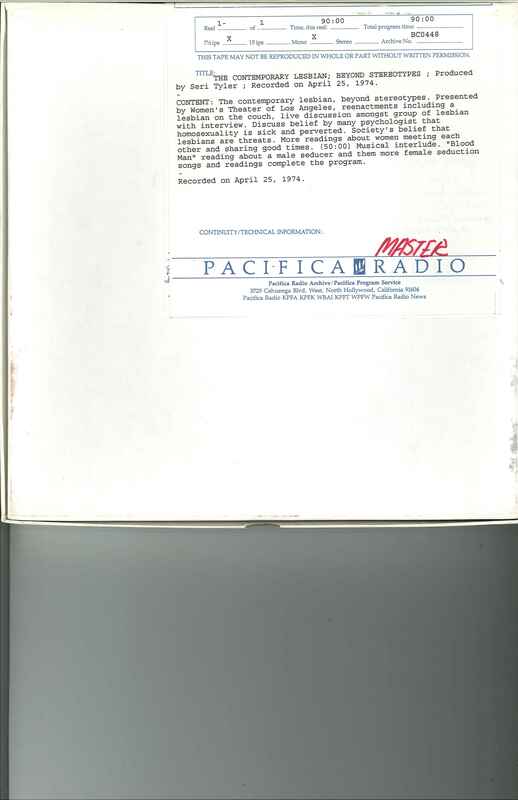 KPFK, 26 Oct. 1971; 29 Feb. 1972. 1 reel (88 min.) : 7 1/2 ips, mono.